TORONTO, March 20, 2018 – Welcome to the 14th edition of the weekly Woodbine Snowbirds Report, now in its seventh year, chronicling the winter adventures of Woodbine-based trainers and jockeys currently plying their trade south of the border. This week, we check in with trainer Steve Owens, who’s racing over the winter for the first time in his career this year. Owens currently has a small string at Gulfstream Park, and so far, the results on the track have been positive. Through 14 starts at the current Gulfstream meet, Owens has won a pair of races, while finishing in-the-money with half of his starts. Owens said he opted to continue racing into the winter because a couple of his horses prefer longer distance races. Owens has recorded wins this winter with White Moon on January 1 and Head Hunter on February 11. Owens started the Gulfstream meet with five horses, and is currently down to four after having to retire a two-year-old filly with shin issues. Owens lost White Moon and Josie’s Riddle to claims during the winter, but he has also claimed Leroids Mommie and Emperor John to replenish his numbers. Owens said he’s still looking to add to his stable while in Florida. “We have four runners right now stabled at Gulfstream, and we’re looking to add one or two more before we come back to Canada,” he said. Owens said he’ll remain at Gulfstream through the end of the Championship meet on March 31, and will continue racing there into mid-April, before returning to Canada in time for the start of the Woodbine meet on April 21. Three Woodbine trainers made trips to the winner’s circle last week, including Mark Casse, who recorded a pair of wins from Bletchley at Gulfstream Park on March 15 and Elusive Mischief at Fair Grounds on March 16. In all, Casse recorded two wins, four runner-up finishes, and two third-place finishes from 18 starts last week. Norm McKnight also recorded a pair of winners on March 15 at Oaklawn Park from Cadillac Red and Bearsatlanticmist. McKnight also recorded a runner-up finish from After Party at Oaklawn on March 16 from eight total starts last week. Michael Wright was back in the winner’s circle at Tampa Bay Downs with Greenfield on March 17. Wright also sent out Spunsational to a sixth-place finish at Tampa Bay Downs on March 16. Three Woodbine jockeys also recorded wins last week, led by Jermaine Bridgmohan, who won a pair of races on the March 13 card at Sam Houston with Posse Dreamin and Samicean. Bridgmohan also recorded two runner-up finishes from 17 total mounts last week. Rafael Hernandez recorded a stakes win on the March 17 card at Turfway Park with Camelot Kitten in the Kentucky Cup Classic Stakes. Hernandez also recorded one runner-up finish and two third-place finishes from 13 total starts last week. Ismael Mosqueira recorded a win with Run Harvey Run at Turf Paradise on March 12. Mosqueira had 10 in-the-money finishes from 16 starts last week, as in addition to his win, he also recorded three runner-up finishes and six third-place finishes. Luis Contreras recorded two runner-up finishes and a third-place finish from 10 starts at Oaklawn Park last week. Michelle Rainford recorded a runner-up finish from a pair of starters last week, as Hipp Smitt finished second at Penn National on March 16. Rainford’s other mount of the week, Light My Path, finished fifth at Charles Town on March 17. Gary Boulanger had three starts last week, which included a seventh-place finish on Moonlit Promise in the Grade 2 Inside Information Stakes at Gulfstream Park on March 17. Alan Garcia made three starts in stakes events at Turfway Park on Saturday, as he finished seventh on a pair of runners including Honorable Treasure in the Rushaway Stakes and Senior Investment in the Kentucky Cup Classic Stakes. Garcia also rode Bombshell, who finished 10th in the Latonia Stakes. Kirk Johnson made six starts at Mahoning Valley last week, finishing fourth on a pair of runners, including Eildon Hall on March 12 and Power Pop on March 16. Emma-Jayne Wilson made two starts at Gulfstream Park last week, with her best finish coming aboard Red Fever, who was fourth on March 17. Here’s a look at how the other Woodbine trainers fared last week, in alphabetical order, starting with Kevin Attard, who recorded a runner-up finish with Robusto on March 17 at Gulfstream Park. Sid Attard also recorded a runner-up finish last week, as Hyatt’s Dude finish second at Gulfstream Park on March 16. Red Fever finished fourth at Gulfstream Park on March 17 for Tino Attard. Roger Attfield sent out a pair of runners last week, including Redoute’s Light, who finished eighth at Gulfstream Park on March 17, and Must Be Dreaming, who finished fifth at Tampa Bay Downs on March 18. Reade Baker sent out Just Be Kind to a fourth-place finish in the Grade 2 Inside Information Stakes at Gulfstream Park on March 17. Josie Carroll also saddled a runner in the Grade 2 Inside Information Stakes at Gulfstream Park on March 17, as Moonlit Promise finished seventh. Michael De Paulo sent out a pair of runners at Gulfstream Park last week, including Flight Deck (fifth, Mar. 14) and Silent Jet (10th, Mar. 17). Scott Fairlie recorded a pair of runner-up finishes at Penn National last week, as Hipp Smitt was second on March 16 and Sick Love was second on March 17. Fairlie sent out four runners in all last week, as Light My Path was fifth at Charles Town on March 17, and My Pal Katherine was sixth at Penn National on March 17. Nicholas Gonzalez had three starters at Gulfstream Park last week, hitting the board with Hey Howie, who finished third on March 15. Gonzalez also recorded a fourth-place finish with Black Sea and a fifth-place finish with Savannah Roxanna, both on March 14. Paula Loescher recorded a runner-up finish from two starters at Tampa Bay Downs last week, as Prison Padre finished second on March 14. Loescher’s other starter of the week, Perfecto, finished seventh on March 17. Silky Mitts finished second at Charles Town on March 17 for Donald MacRae. John Mattine sent out four runners at Gulfstream Park last week, hitting the board with Signature Twirl, who finished second on March 15, and Tonedaddy, who finished third on March 16. Mattine also sent out Vaughan to a fifth-place finish and Budding to a seventh-place finish on March 15. 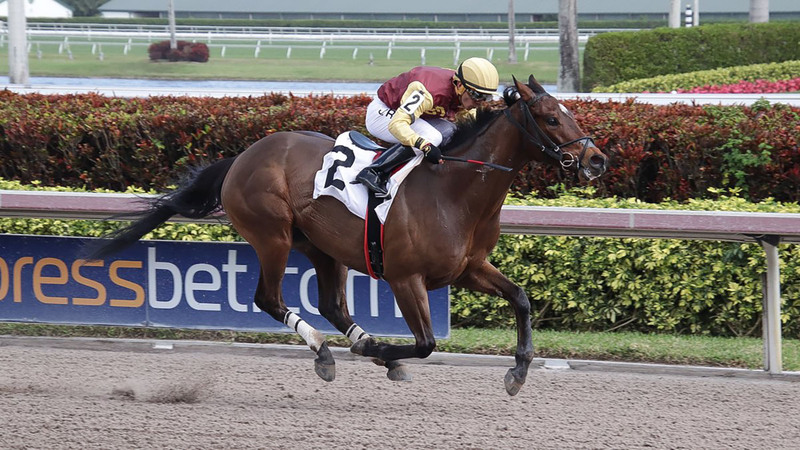 Adios Mia finished 10th at Gulfstream Park on March 17 for Michael McDonald. William Tharrenos sent out three horses at Gulfstream Park last week, including Perfect Tay (sixth, Mar. 14), Tizwar (seventh, Mar. 15) and Third Republic (seventh, Mar. 18). This entry was posted in Woodbine News and tagged Camelot Kitten, Emperor John, Head Hunter, Horse Racing, Jermaine Bridgmohan, Leroids Mommie, Mark Casse, Norm McKnight, Opening Day, Rafael Hernandez, Snowbirds, Steve Owens, White Moon, Woodbine. Bookmark the permalink.